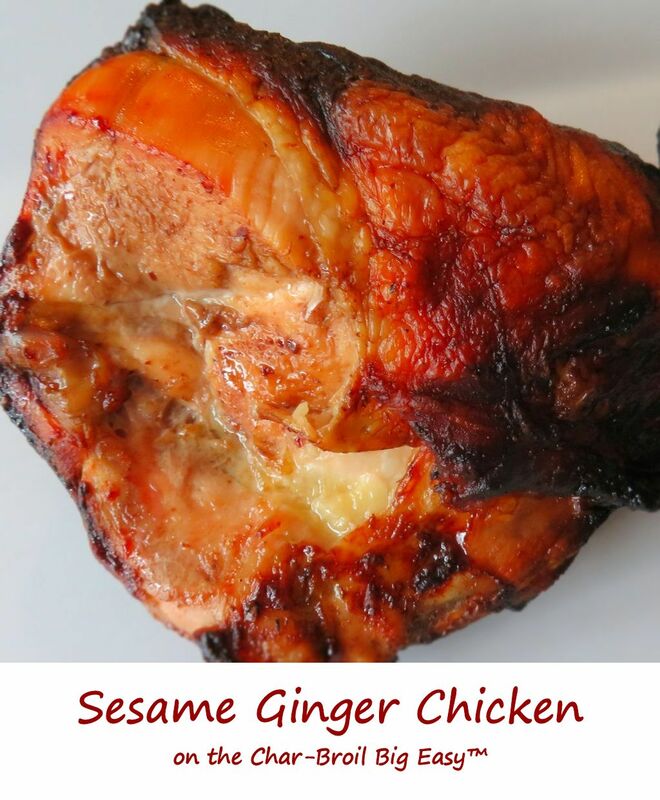 Sesame ginger chicken on the Char-Broil Big Easy is a mighty fine example of just how easy making good chicken can be. A quick marinade in salad dressing and into the cooker. No mess, no fuss, no baby sitting a grill. In no time you get juicy, tender, super tasty chicken with a hint of sesame and ginger. I prefer split chicken breasts, but any cut of chicken will do. I tend to prefer bone in pieces, since they will end up being juicier and more flavorful than boneless cuts. I used a bottle of Newman’s Own Sesame Ginger salad dressing as the marinade for the chicken. You can use your favorite brand or flavor of dressing, but steer clear of any that contain sugary things like… sugar. Or honey. Or brown sugar. The Big Easy cooks at a fairly high temperature. Sugary marinades will char and char good in no time. If you do use one that contains sugar, you’ll want to rinse off the chicken before putting it into the cooker. Yes, you’ll loose some flavor (the marinade will still be inside of the chicken), but you won’t run the risk of burning your dish. Place the chicken into a resealable bag or container. Add marinade to taste. Toss to coat. Seal and refrigerate for at least 4 hours, turning occasionally. Transfer the chicken to the Big Easy basket. Cook for approximately 20 minutes per pound or until it reaches 165 F as checked in several places. Remove and let rest 10 minutes before serving.